The solar powered security light works well for driveways, walkways, sheds and garages. There are no operating costs to worry about, and you don't need an electrician to install it. In fact, just about anyone can install this light. The light has an automatic sensor that makes it turn on when motion is detected. The sensor is adjustable, and can sense motion up to 35 feet away. After charging in full sunlight, the security light can be activated successfully up to 360 times when set to a 60 second interval. The solar powered security light is pretty bright for a solar light. The 80 LED bulbs really do the trick. It isn't so bright that it is blinding, but it is brighter than a flashlight would be, possibly similar to a 75 watt incandescent bulb. That in itself is a great advancement for outdoor solar lighting. The light is blue-white in tint, like most LED lights. The light is very durable? even after falling it still works. The settings are adjustable. You can change the amount of time the light shines after being activated from 20 seconds all the way to 2 minutes. The light is very easy to install, and the length of the cord makes it easy to set up the solar panel where it will get optimal amounts of sunlight. The light holds up to weather changes very well. Once installed, the light is very attractive. The solar powered security light doesn't function well in cold temperatures. The sensor may be a bit temperature sensitive and this was not noted in the materials. The batteries take more time to charge with winter sunlight, but the light still functions. There are issues from time to time with quality control. Some lights arrive broken or do not function out of the box. The regular price is a bit high, especially when you consider the quality issues. If you can buy it on sale, it is a much better deal. 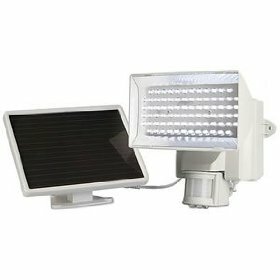 For the most part, the solar outdoor security light does the job. It is much brighter than most outdoor solar lights, and illuminates the area fairly well. While still not as bright as a wired security light, the motion sensor is enough to scare off wildlife and other creatures that may approach the house. The adjustability of the settings is a good feature, and the light can be adjusted 180 degrees to cover the area you want. This light would be a good addition for the security of your driveway, walkways, sheds or other areas of the yard. The light looks good on the house, so it adds to the value of your home.